Renaissance Residence as Rustic Rural Retreat? A visit to the Mason Collection today and to a very fancy "Hatters Castle" type dwelling in County Westmeath. While it looks formidable those windows and doors probably indicate that it was never intended to repel anything other than the weather. Is it still standing and where is/was it? sharon.corbet raises interesting points. Firstly she thinks that this photo is reversed and I am inclined to agree with her. Secondly she believes this photo is some form of a cropped (and reversed) version of L_CAB_03197 and again we fully accept her proposition. The above points do beg the question as to the relationships between the different photographers, why? how? does Mason end up with a Lawrence generated negative? sharon.corbet DannyM8 O Mac Niall McAuley BeachcomberAustralia I think it is a dog and he/she has moved before L_CAB_03198 was snapped. Bualadh bos, [https://www.flickr.com/photos/[email protected]]! And lovely 'lliteration, Mary! 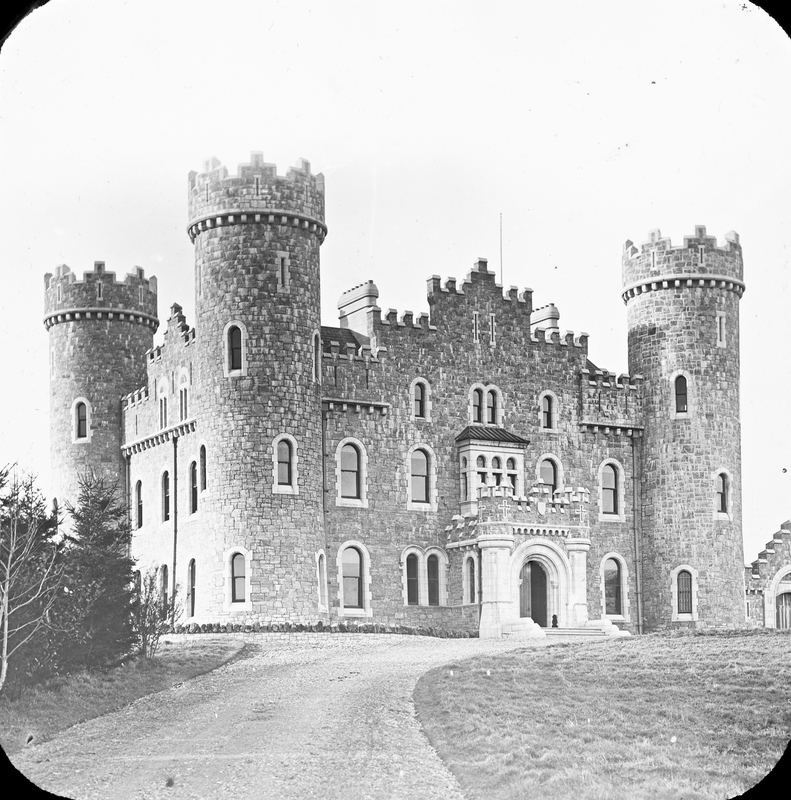 Per the NIAH: built between 1867-76 ... One of the last great Victorian castles/country houses to be built in Ireland during a period when the great houses were in terminal decline. Built for Lord Greville, see yesterdays notes for details on him. Perhaps this 32 windower in the 1901 census? Still no Grevilles, just staff, with Richard Taylor the Butler as Head of Household. Not even a Butler by 1911, just a 75 year old housekeeper and a gamekeeper. at last my knights! Camelot ! This picture seems to be reversed, the small extension should be on the left of the front door, not the right, as in the Lawrence photo, and in the "additional views" on the NIAH page [https://www.flickr.com/photos/gnmcauley] linked to above. In fact, I suspect it is a cropped, reversed version of this Lawrence photo. [https://www.flickr.com/photos/[email protected]] is always amazing! Well done the Professor! Do I see a dog on the porch or is it a wee pawn to go with this rook? [https://www.flickr.com/photos/[email protected]] I was trying to figure that out earlier. I think it is a dog that moved its head during the exposure, but I'm not certain. Whatever it is, it's not in all the photos of Clonyn Castle. [https://www.flickr.com/photos/scorbet] Could be, a black dog sitting looking at the camera. It might be a dog, then again it might not. Perhaps they were cloning in Clonyn. You never know what you'll find once you start delving in Delvin. The Beast from Westmeath! Thank you for the comments, summary and map have been updated.